This series is devoted to the publication of research monographs, conferences or workshops originating from the Institut de Recherche Mathématique Avancée (Strasbourg, France). The goal is to promote recent advances in mathematics and theoretical physics and make them accessible to a wide circle of professional and aspiring mathematicians and physicists. Papadopoulos: Metric Spaces, Convexity and Nonpositive Curvature. Biquard (Ed. ): AdS/CFT Correspondence: Einstein Metrics and Their Conformal Boundaries. Bertrand et al. (Eds): Differential Equations and Quantum Groups. Nyssen (Ed. ): Physics and Number Theory. Papadopoulos (Ed. ): Handbook of Teichmüller Theory, Volume I.
Papadopoulos (Ed. ): Handbook of Teichmüller Theory, Volume II. Weber: Dynamical Systems and Processes. Connes, Fauvet, Ramis (Eds): Renormalization and Galois Theories. Cortés (Ed. ): Handbook of Pseudo-Riemannian Geometry and Supersymmetry. Papadopoulos (Ed. ): Handbook of Teichmüller Theory, Volume III. Papadopoulos (Ed. ): Strasbourg Master Class on Geometry. Papadopoulos (Ed. ): Handbook of Teichmüller Theory, Volume IV. Blanlœil, Ohmoto (Eds): Singularities in Geometry and Topology. Papadopoulos, Troyanov (Eds): Handbook of Hilbert Geometry. Latschev, Oancea (Eds): Free Loop Spaces in Geometry and Topology. Papadopoulos (Ed. ): Handbook of Teichmüller Theory, Volume V.
Papadopoulos (Ed. ): Handbook of Teichmüller Theory, Volume VI. 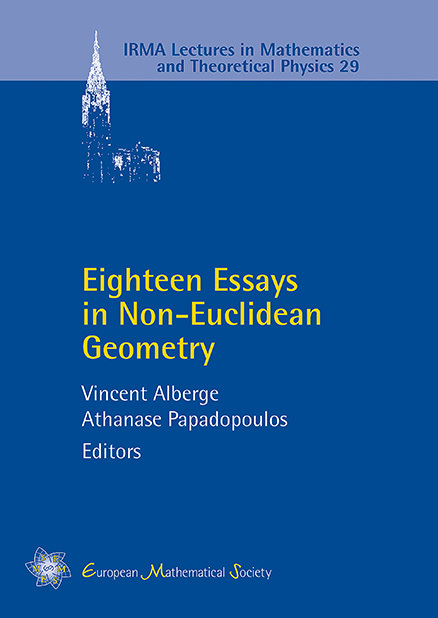 Alberge, Papadopoulos (Eds): Eighteen Essays in Non-Euclidean Geometry.